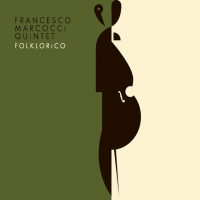 This volume of music affirms Francesco Marcocci’s exemplary music and double bass prowess as well as serves to further draw attention to the still underrated composer’s quirky, inventive and emotionally engaging output. Clearly he is a bassist and a composer who seeks the path that Charles Mingus disappeared into off and on throughout his life; examining folk forms of different kinds and their relationship to what he wanted to do. Likewise Mr. Marcocci has turned in a complex recording that appears to be an agglomeration of the effects that Mr. Mingus’ The Jazz Experiments of Charles Mingus (Bethlehem, 1957) and Cumbia and Jazz Fusion (Atlantic, 1978) have had on this young bassist here. There is a very real sense of moving in and out of folk forms – Mr. Marcocci’s internalised ones, as well as some, like the Moroccan (Gnawa) ones in Ribollita. Package that with the abrupt changes in tempo and asymmetrical rhythms, and you have something Mingus-like if not wholly dedicated to The Great One. Folklorico has clearly also been made at the height of a creative outburst. True it is a small set of just seven songs, but each is wonderfully crafted, with dramatic melodic twists and turns that anticipate both early and late music of Charles Mingus. The twist, of course is all Mr. Marcocci’s where he weaves in his own folk forms of landó and festejo, and joropo, with the idiomatic phrasing and rhythms of jazz. Equally fascinating is the music’s unpredictable, increasingly decorous thematic trajectory and the myriad modulations of minor keys. All this has a very avant-garde feel even today, after reams of tape have been spent by musicians experimenting in the bringing together of folk music – especially from South America into the realm of jazz. Nothing is easy here but it certainly seems so. Technical demands are huge and the pressure to show up with virtuoso performances is great, no matter what instrument is being played. Francesco Marcocci’s wonderful sense of registral balance and articulation intensifies and colours the music as it assiduously shifts from one phrase to another. The original folk forms, or, more properly, traditional forms are quite decorous to begin with, the changes sometimes appear busier than they need to be. For example the slower movement of On A Sentimental Journey dissipates under the weight of additional notes (played on the keyboard) and octave transpositions. Similarly this part’s contrasting themes and emotional nature convey a dreamy profile in their melodic guise. However, the aria-like nature of the melody retains its essence from end to end. The flanking songs are no less riveting, notably Danny Richmond – Raw, which is most Mingus-like in the entire repertoire. Its magnificent rhythmic changes are stunning throughout and so is the gorgeous playing of Francesco Marcocci. And let’s not forget the other musicians on the record especially Leo Genovese, the spectacular drummer Willy Rodriguez and of course the ubiquitous and always fascinating Dave Liebman on three tracks. Why don’t more musicians jump on this kind of melding fusion as a matter of course? The judiciously reverberant sound and the large-sized instrumentation that Mr Marcocci favours illuminate the composer’s carefully dynamic contrasts, bringing welcome vibrancy and presence to the performances. The sound engineering is also superb. This volume provides an attractive entry point to one of the most interesting young figures in music today. Track List: Shardana; Galicia; La Grande Madre; On a Sentimental Journey; Pa Abalos y Messiaen; Danny Richmond – Raw; Ribollita. Personnel: Godwin Louis: alto saxophone and soprano saxophone (3); Leo Genovese: piano, Rhodes, bagpipe, mbira (3), tenor saxophone, realistic Moog, hand-claps (5); Francesco Marcocci: double bass and hand claps (5); Damion Corideo: percussion; Willy Rodriguez: drums, jingles, vibraslap and claves (3); Special Guest: Dave Liebman: tenor and soprano saxophones & flute (1, 4 & 7).